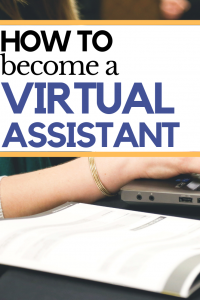 In the land of the internet, there are so many ways to make money from home, including one of the most popular options — become a virtual assistant or more known as a “VA” in the working online world. 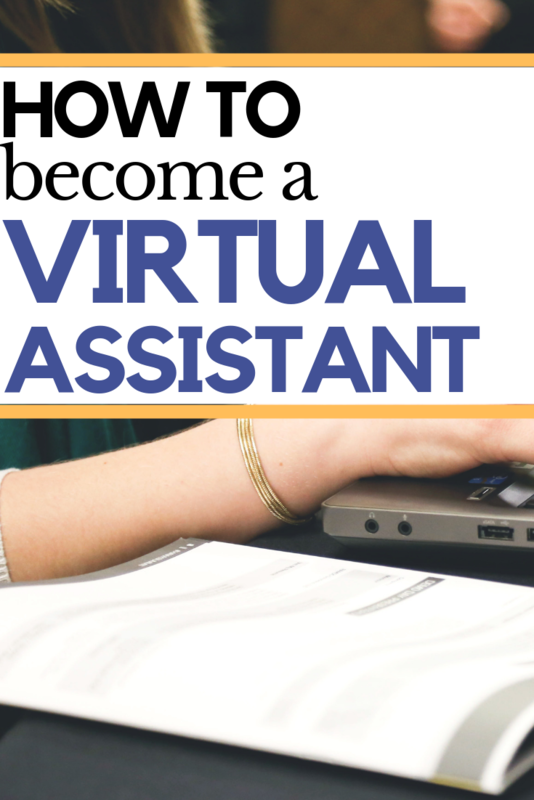 And in today’s post, I wanted to talk about the many ways you can become a virtual assistant as well as more than 100+ services (even if you don’t have experience) you could consider if you wanted to become a virtual assistant. As a fair warning, there are a lot! Hopefully, by the time you’re done, you can take action and make money in the comfort of your own home, all while being your own boss doing the things you love. So when you’re ready, let’s begin! 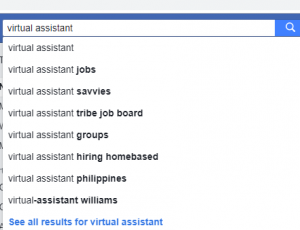 First, for those who may be confused as to what a virtual assistant actually is and what they do in terms of job duties, let me explain. In short, you can kind of view the position as an administrative assistant, where you may help a business owner or company with specific duties, but it can be much more than this. You will see what I’m talking about later on in this guide as the services you can provide as a VA is quite diverse! But, of course, instead of going to an office, all of your work will be done online, which means you can work at home without that dreaded morning commute! It’s a fantastic and legit work-at-home opportunity for whose looking to make money at home. In short, it’s the best to view a virtual assistant as someone who provides services, often something you’re good at, for a flat fee arranged by you and the other party if you plan on becoming an independent contractor. DON’T BUY $300+ COURSES! I was a VA in the past and learned everything I needed to know in extremely cheap books on Amazon.com, including Become A Successful Virtual Assistant: Learn the Business Side & Ditch 9 to 5, a highly-rated book that teaches you everything you need to know to become a VA.
Do I Need a Set of Skills? While it helps to have a marketable skill, it isn’t necessary as a lot of these jobs entail very simple tasks, such as answering emails, scheduling appointments or managing a website, for example. Most successful VAs will tell you that it’s important to be an excellent communicator, detail oriented, quick learners, and more importantly — DEPENDABLE. If you think you at least have these skills, then there’s no reason you can’t jump in and attempt to find a VA gig. On your end, however, it’s important that you have at least a computer, a reliable internet connection, Skype and office productivity software in order to work successfully. A quiet area helps as well! Starting off as a VA can be quite a challenge as you’re going to be competing with a LOT of people, including overseas workers who can charge ten times less than you. BUT, please don’t let these words discourage you as you need to find your niche that you know you can market to business owners and thrive in the future. And since I can’t offer a specific gameplan, I can offer you words of encouragement as to how you can get started to hopefully start making money in the near future. First, how do you want to set up your business? The first thing you’re going to want to ask yourself is how you’re going to want to work as a business. Do you want to work just a few hours a week and make a few dollars a month? Do you want to be an independent contractor or want to be hired as an employee? Each has its own pros and cons, so it’s really up to you to decide what works for you. Or do you plan on turning this into a fully fledged full-time business that makes you a comfortable living? Regardless, if you plan on making more than $600 a year or even thinking about turning into a full-time gig as an independent contractor, it’s best to sit down and talk with an attorney to see what kind of business setup works for your situation and ways to protect your personal assets. To save you money and time, I highly recommend LegalZoom, a very reputable online attorney/legal service that can help you with your business plan over the phone. They can even help you with your business formation (LLC, Corporation, etc) if need be. It’s a great way to avoid the hassle of visiting an attorney in person and can be done in the comfort of your home for a low cost. I used LegalZoom when creating my LLC for this very website as well as for some attorney advice and can’t say enough good things about them. It’s awesome. As I will get into at the end of this massive guide, you will need to think about the services you want to offer as a VA. And as you’re about to see, there are HUNDREDS of services you can offer. From writing content to managing emails and making phone calls, it’s time to sit back and think about what you’re good at as well as what you think will be enjoyable. Remember, you don’t want to chase the money here; instead, find something that will interest you throughout the day to keep you motivated and going. In some cases, you won’t even need that much in terms of experience, I promise. And while picking out a specific service you want to offer can be tricky, you can always change this plan in the future if you’re finding it hard to promote your services or are simply burnt out. Again, I can’t reiterate enough — there are TONS of services you can offer, and I can assure you that you can find something that will make you money. Take a look at my list below, pick out a few ideas and TAKE ACTION. Today, there are so many ways to launch your online presence, from building your own website to creating a listing on a freelancing website or even a social media profile, all of which doesn’t take that long to do. And depending on how you want to market yourself, it’s really up to you as to how you want to work online. 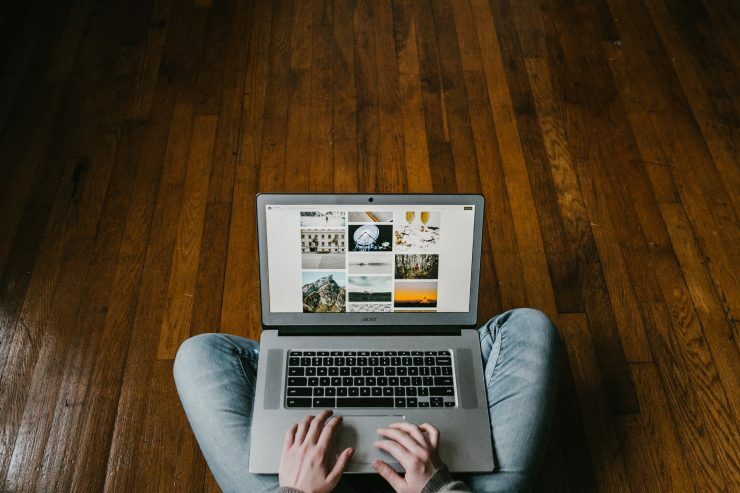 Freelancing websites are a great way to get the ball rolling, but in some cases, you may want a personal website to help market your services. Social media is also a good idea, especially if you plan on marketing in groups and/or using ads in the future. And in all honesty, the only reason I would create a website, at least for now, is if you wanted to market your portfolios, such as graphic design, content creation, web design or anything that can help increase your chances of landing a job. Regardless, creating a website is always a good idea, but don’t stress about it too much in the beginning. But, if you REALLY want a website right now and don’t have the skills to create one, that’s okay as Wix.com and even a free WordPress account can at least get you started for now. These platforms already did the dirty work for you so all you need to do is point, click, write and that’s about it. But, again, if you don’t start the website right now, you can always do it in the future. All of these websites work in different ways, but regardless, create a profile on all of the ones you can to increase your exposure as well as to apply for jobs when one pops up. Keep in mind some may charge you a fee to start bidding on jobs, whereas Craigslist, for example, allows you to search jobs and apply as you normally would with a 9-5 job. Fiverr, on the other hand, will take a percentage for every sale. From Facebook groups to even letting the world know you’re available, don’t underestimate the power of social media. 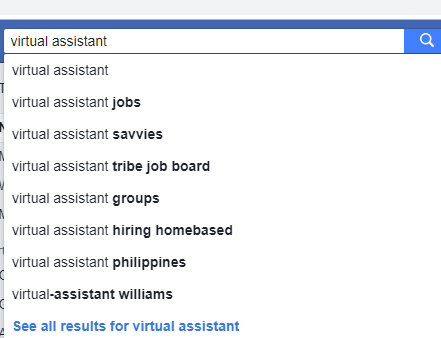 In my opinion, however, the best way to find a job in the social media world is by searching for certain Facebook groups. From there, pick out a group that has a decent amount of members with at least 10+ a week. There’s no reason to join a stale group with no action. Also, if you purchase the Bootstrap VA on Amazon, for instance, you can gain access to one of the best VA groups on Facebook, making it a great opportunity to network with like-minded people who also purchased the book as well. And as long as you come off as a helpful person, you can potentially learn about people, as well as organizations, looking for a certain somebody or get word on a future hiring spree. Join these marketing channels, but don’t start spamming your skills. This isn’t what the group is designed for. Aside from people who may be hiring, it’s also a great way to learn about ways to promote yourself, where to look for work and so much more. There are actually a lot of virtual assistant companies out there that you may want to consider applying to if you either want to expand your horizons or want the company to find the clients for you. Listed below are a few companies you may want to consider applying with, but do keep in mind that some of these companies are looking for a particular skill set and may ask you to take an assessment to learn more about your talents. This is just something to keep in mind. The entire process is easy. Fill out the application, and if you’re seen as a good fit, they will get in touch. Remember, some may ask you to take an assessment test, aside from the application, to see if you’re a fit for the company. All of these companies are 100% free, and it doesn’t hurt to apply if you want to expand beyond the freelancing websites and social media groups. Lastly, if you’re an active user on LinkedIn, consider reaching to your network to let them know of the services you can offer. Then, take a glance at your connections to see if anyone may be interested in your services and/or know of somebody who may be. While you don’t want to take advantage of this opportunity, it is a great way to refresh your mind as to who you have connected with professionally in the past. Lastly, It’s time to market yourself! Sadly, this is where so many potential VAs or freelancers stop. You find some ideas, read a few books and never take action. I was a VA once in the past, where I helped a small publishing company manage their content and do some odd and end jobs, such as answer some e-mails and perform outreach services. And to get this job, I had to take action by listing my services all over, from Facebook to gig-related websites like Fiverr and even apply to countless jobs on Upwork-like websites (it was called Elance when I was working at the time). It was draining at first as I had to bid on so many jobs, reach out to so many people and get declined so many times as I was competing with hundreds of people in some cases. But finally, one business owner accepted my bid and the rest was history. The lesson here is that you need to take action, apply to as many jobs you see fit and learn from your mistakes. And as long as you don’t expect thousands during your first week, you can at least tweak as you can go to learn how to get noticed. You can only read so much online, so you need to find what works for you, trust me on this one! Every situation will be so unique and I can only try so hard to point you in the right direction. First, you’re going to want to know WHO you want to target. If you want to answer emails as a customer service representative, then you may want to research companies online that may need your services. It’s silly to reach out to an individual doing web design work if he or she only has two clients. To find the companies that you should target, you could find blog posts that target that specific niche or even search the freelancing/job boards online. For example, let’s say you wanted to answer emails or just be an administrative assistant online. As there are SO many services you can perform (again, I get into this later), it’s hard for me to advise you who you need to contact. Generally, searching profiles and job postings on freelancing websites is usually a good start. As you can see above, there are 500+ admin-like jobs that you could start working with. Once you know who to target, find these businesses/individuals either online via freelancing-like websites or even cold pitching them directly on social media channels. This is going to be the most draining and hardest part of your journey, trust me on this one. For me, I found the best luck just searching job opportunities on websites like Upwork and using some of the other freelance websites mentioned above. As one of the largest freelancing websites online, hundreds of job postings are posted daily, giving you the opportunity to find jobs that may be of benefit to you. It’s going to be more than that. As a provider looking for services, these professionals are going to look for experience, a portfolio, the right price and reasons why they should hire you. Even if you haven’t worked in the past, create a portfolio or tweak your resume to make yourself marketable. It may take some time but play around with how you apply to see what garners the most responses. Follow the directions in the job post, make sure you can actually do the job and apply with confidence. And with some freelancing websites, you may find that you may need to start cheap or even offer a small sample of your work for free in order to gain some stats and credibility to get lucrative work. Again, this is a tough part of the job, but it can pay off huge dividends if you continue to apply and apply. 3. Be valuable once hired! Once you’re finally able to get a VA job, congrats! It would come sooner or later. But the work doesn’t stop here. If you find a gig, your main goal is to make sure you’re as valuable as possible so that you become a valuable part of their business. Learn the ropes, show up on time, be available when you’re supposed to be and do the job 100 times better than what your boss expects. Trust me, if you get the job done on time and do it much better, then you’re already light years ahead of so many people that work in general. Hard and reliable workers are hard to come by, just remember that. MUST READ: Want to read a book RIGHT now? Again, don’t buy the $300+ courses as The Bootstrap VA can teach you just as much for 99% less than a pricy course. 4.5 rating with 125+ reviews on Amazon! Learn all of the basics without putting a damper on your wallet. So, What Services Can I Offer? Whether you’re researching becoming a VA to work from home full time or are just curious about the position, as mentioned, there are SO many services you can offer, so much so, it can be quite overwhelming. This is the burning question. What the heck can I do as a VA? But, it should be more along the lines of what can’t you do as a VA? And since I love to help as much as I can, I did the dirty work for you and spent HOURS researching the many services you could offer as a VA and included them all in a nice list below, broken down in categories. Depending on your skillset, I can almost promise you that there’s something here that you’re good at, even if you feel you don’t have any experience or skills. Trust me, there will be something. In the meantime, sit back, jot down a few you like and go from there. Of course, I will be missing some skills on this list, and if you know of any I’m missing, do let me know in the comments as I would love to add it to the list. My goal, as with all of the posts here, is to make sure we are as informative as possible, all while offering a fantastic user experience. And no, I don’t want your e-mail so I can spam your inbox, it’s not how we work as an organization here. READ THIS (HIGHLY RECOMMENDED): Here’s yet another book I highly recommend and read in the past, the Virtual Assistant – The Series 4th Edition. Highly rated, with close to 100 reviews, this book teaches you how to become a highly sought after VA.
How Much Can I Make as a Virtual Assistant? When it comes to money, it’s hard to offer an answer because there are so many variables that come into play. For one, it will depend on who wants to hire you. Some businesses want to cheap out and are only looking for overseas VAs who work for $3 an hour, whereas a reputable U.S. organization may actually be willing to pay you a livable wage. Next, what you plan on doing will greatly affect the price. If you’re a programmer, for instance, then your wages can easily surpass $50+ an hour, but if you plan on answering emails, then plan on your wages being around $10 to $15 an hour. Unless you’re hired as an employee, the best thing about being an independent contractor is that you can set your own rates, meaning you’re in control. But remember, if your rates are deemed too high, you may be waiting for a job for quite some time. The virtual assistant world is a very tough egg to crack, especially if you’re living in the United States, and let me explain why. For one, you’re competing with a lot of foreign competition that can do the same job as you 99% of the time. And as you may already know, they can work for $3 an hour and still make a living where they reside. You just can’t compete with this sadly. Secondly, even if you get hired, there’s a good chance you will have a very demanding boss who demands you are as passionate as much as they are. This can be the case for most startups. If you lack the passion, you could find your way out the door fast. And lastly, while you can work from home, be prepared to be on call 24/7 because these people are going to look at you like a servant. If they need something at 3 a.m., they will more than likely expect a response in minutes, and I’m not joking. Yes, there are great people out there, I know, but I love to tell the truth here so that you don’t jump and think you’re going to make $22 an hour, all while sipping a martini on the beach. In the end, I hope this guide helped you understand the world of VAs, and as I mentioned, DO NOT purchase any $300+ guides. You will see these since most bloggers make a pretty penny promoting them, and I CANNOT stress enough, they are not worth it. You’re just making the blogger richer and you’re not going to learn much more than what you can here and on other free websites. In the meantime, if you have anything you’d like to share in regards to the world of VAs, be sure to do so in the comments below!